Canadian Federal Minister of Immigration, Refugees and Citizenship, Ahmed Hussen, made an announcement regarding the effective date of changes, done to the Citizenship Act, by adopting of Bill C-6. 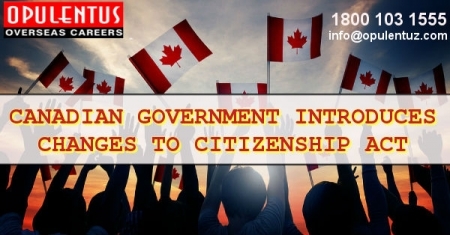 PRs in Canada can apply for citizenship (naturalization) in an easy and quick manner than before, subsequent to the implementation of important measures in the Bill C-6. Speaking in Ontario, he said that, Canada needed all the permanent residents to become citizens because there is a great value in Canadian citizenship. The country had continued to welcome people from all regions of the world. There was an understanding, and the realization of the importance of, the positive role played by the immigrants in its economy, in the society, as well as in the cultural domain. His comments highlight that the citizenship is a status which can be obtained subsequent to a person becoming a PR of Canada. Applicants were required to be present physically in the country for four years out of six prior to seeking citizenship. Applicants now are required to be present physically for just three out of five years for seeking citizenship. The Applicants had to file for income tax returns, when required, for four (out of six) years, aligning with the requirement of physical presence. The Applicants are required to file income tax returns, for three (out of five) years only, aligning with the requirement of physical presence. The Applicants had to be present physically in the country for 183 days previously in four (out of the six) years before their registering their application. The Applicants now this provision has been repealed. The Applicants are no longer required to meet this provision. Time spent in Canada before becoming a PR was not counted for the physical presence requirement for citizenship. Applicants now can count every day of their presence in the country as a temporary resident/protected person before becoming a PR as a half-day. This will help them to meet the physical-presence criteria for citizenship, stretching up to the highest benefit of 365 days. Applicants from 14 to 64 years were required to meet the language and knowledge criteria for citizenship. Applicants from 18 and 54 years are required to meet the language and knowledge criteria for citizenship. These provisions will ease out the potential immigrants and help in more immigration in the future.